Stamping time-YEAH!!! 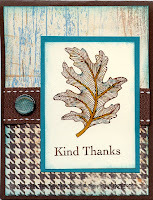 This was inspired by the Stamping 411 Saturday Sketch challenge. I love these sketch challenges to get you going when you're creatively challenged, or just out of practice!! This is a sneak peak from the upcoming Holiday Mini Catalog. Be watching your mail-it should be arriving soon-& it's packed full of GREAT new things!! This set is called Autumn Splendor, and the DSP is Autumn Meadows. They combined for a quick & easy card! The card base is Chocolate Chip, both backgrounds are DSP. The leaf is inked with Chocolate Chip, then thumped with Taken with Teal, More Mustard & Really Rust. They don't show alot due to the dark color of the Chocolate Chip, but the color flecks are there. I colored in the vein on the leaf with my More Mustard marker. Kind Thanks is from the Thank you Kindly set. Ribbon is the 1" Double Stitched grosgrain in Chocolate. Lastly, a Build a Brad with punch from the DSP Taken with Deal pattern sheet. Super pretty, gorgeous colors! Wow! Beautiful job! I can't wait to play with that paper. So glad you played along this week! This is just gorgeous!! I love it!! I have not been sold on this DSP yet but I think you just did it for me!! Thanks for playing along this week too!! I love your card, I just got that DSP and can't wait to play with it! Thanks for playing along this week!